Psychological and psychoeducational assessment procedures. Development and implementation of psychological and psychoeducational interventions and rehabilitation. ENPAIR has its own on-line Open Access journal: PAIR (Psychoeducational Assessment, Intervention and Rehabilitation). PAIR publishes high quality articles on theoretical and empirical research regarding both psychological and psychoeducational assessment in all areas related to cognitive and socio-emotional development (with a specific interest in dynamic assessment and dynamic testing), and effectiveness of cognitive and metacognitive interventions in education and rehabilitation. Psychoeducational Assessment, Intervention and Rehabilitation (PAIR) invites researchers to submit their original, unpublished manuscripts for inclusion in an upcoming issue. All empirical submissions will be reviewed and evaluated based on originality, quality, and relevance to the journal’s scope. All accepted articles will be published online (in PDF with a DOI number). 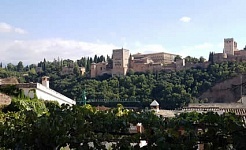 The second ENPAIR conference will take place at the University of Granada, Spain. Place of venue will be the University of Granada, Spain. Our journal PAIR invites you to share your ideas for a special issue. Of course, individual manuscripts are welcome. Please, send us your contributions.